Written by Taariq Shabazz, sub-pages written by Kurt Kessler. The world of men and women’s soccer has many intriguing aspects that make the game the most popular sport in the world. In this webpage I will be delving into the fan base differences between men and women’s soccer and the difference in atmosphere that fans create. Through the different demographics, routines, and reasons for attendance the fan base varies greatly between men and women’s soccer. There are differences in the fan bases of men and women’s soccer, though there are similar aspects as well. For example, the demographics vary highly between men’s and women’s soccer fans. 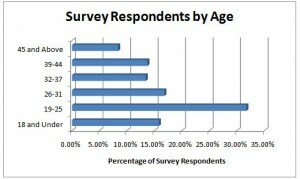 Two of the aspects are the gender and age group of the fans at the game. Gender and age are big components of the atmosphere of the crowd. By having this information about the fans alone, you can grasp an understanding of the ambiance of the crowd. Through research from the world cup and other major soccer events, we know the majority of the fan bases of men’s soccer games were around the ages of 19-25, while the fan base of women’s soccer is comprised of youth between 10 -15(boston globe). The age difference of the fans is not extremely large, but the group and stage of life the fans are in completely change the feel or atmosphere of the stands. 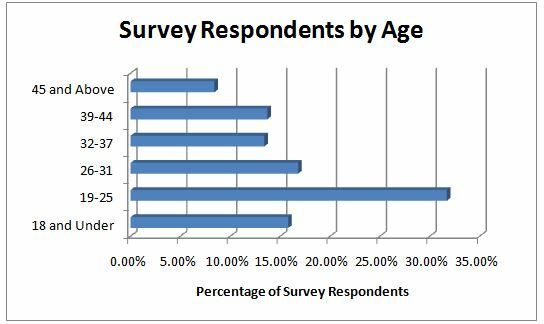 Fans between the ages of 19-25 would be predominantly college kids compared to preteens and young teenagers who are in the younger age group. College kids would be a lot more rowdy and more likely to drink alcohol, which could lead to more erratic behavior. On the other hand, preteens would be more likely watch and attend the game more for the love of the sport or to root for a popular player who might be a role model for the young viewer. In the next section, I will address the importance of role models for fans’ motivation. The genders of fan bases of men’s and women’s soccer also play a role in the environment of the crowd. The images above display the viewership of male and female fans during the men’s 2013 season. As shown, 68% of the total number of fans were men, while only 32% of the total number of fans were woman. However, intriguingly, a study by Funk, Mahony and Ridinger in 2002 of the 1999 Nike cup (a women’s soccer tournament) showed 61% of fans were women and 39% (the atlantic) were men, which shows a complete reverse of genders. By looking at this statistic and then trying to imagine the crowds, I would picture that the men’s game would be more likely to have aggressive yelling fans, while the fans at women’s games may be slightly more passive. In the section researching motivation for fans, I will hope to shed light on whether or not this hypothesis is true. Looking at age and gender together in men’s games, we can see predominantly male young adults at men’s soccer games, and in woman’s games, we can see female preteens. The crowd demographics, by these extremes, will completely alter the fan experience between the two games. In my next section about the motivation of fan attendance, I will analyze why certain fans attend women’s games, and why fans attend men’s games. Since men and women are playing the same game, how can something as trivial as gender completely alter the fan base? The section above shows us that a general conclusion can be made that there is indeed a difference in fan base between woman and men’s teams. From this conclusion, the next step would be to analyze why this is. The question to ask is what motivates certain groups to attend woman’s games and what motivates certain groups to attend men’s games. Since the audience of women’s soccer games is mostly teenage girls, it is not surprising that a study by Funk, Mahony and Ridinger shows that the main reason that fans attend women’s soccer games is for role models. This makes a lot of sense because they are at a impressionable age. Also, there is a big push in todays society for women and men’s roles in sports and the work place to become equal. The push for gender equality would make the professional women soccer player a perfect role model. Men’s sports in general are more watched on average than women’s mainly because men’s sports have been around longer than women’s. Since the push to watch women’s sports is relatively new, the motivation for the fans will not be the same as men’s sports. Men’s soccer fans motivation is more based off the traditional excitement and thrill of the game. Since men’s soccer fans mainly are in the age group of 18-25 year olds, the search for role models is not really present. The main reason for male attendance is the thrill and excitement and less the moral learning or development like women soccer fans go for. The atmosphere in men’s games is a lot more intense then women’s games. In the video you can see the soccer fanatics with painted faces, crazy chants, and drinking alcohol. In the video it said purpose for the fanatics is said to support the team but also to take part in the team’s victory. The fans strongly highlight winning with chants of defeating the other team. The intensity of the fans towards there team and emphasis on winning turn the stadium into a war like area where the pressures of winning have skyrocketed. In the women’s video chants uplifting there team were held also posters with popular player names on them. This coincides with the evidence found earlier where young teenage girls are more there for player support and role models. As you can see in the men’s idolization of certain key players are present but more focused on insuring that the player preforms highly. As you can see from the video the environment of preparation for the women’s game is a lot more festive. It seems almost like a celebration for the player getting ready to play. The intensity compared to the men’s game is a lot lower and on the video there did not appear to be any alcoholic beverages around. The chants by the women were rooting for the team and some players and the ones about victory were not nearly as intense as in the men’s game. You can see the mass amounts of glittery posters with some of the soccer stars names on them highlighting the research done in sections above about role models being the motivation for women’s soccer fans. Although an extreme incidence, riots like this are not rare when it comes to men’s soccer matches. In the sections above I described the intensity of the fans chants as war-like, which also creates a violent atmosphere in the stadium. The riot caused the death of 73 people. How could a soccer game spark such a horrific event? Games like this get fans so emotionally involved that when the team loses it is completely devastating to them and in response to the devastation violence is the action that fans seem to take. In the video, hundreds of fans stormed the field fighting, trampling and throwing objects at people. The fans have no personal conflict with the opposing team’s fans, but because they still feel obligated to attack them. Similar to war, where soldiers have no personal conflict with the other soldiers but attack them for a greater cause, in soccer riots, it is their countries pride. The war/ battleground atmosphere that fans create is part of what makes the sport and makes soccer the most popular sport in the world, but it also causes horrific incidents like this to happen. How could a soccer match lead to such a incident where people lose their lives? This is jaw-dropping. The picture above shows a display of racism by an out-of-control fan. 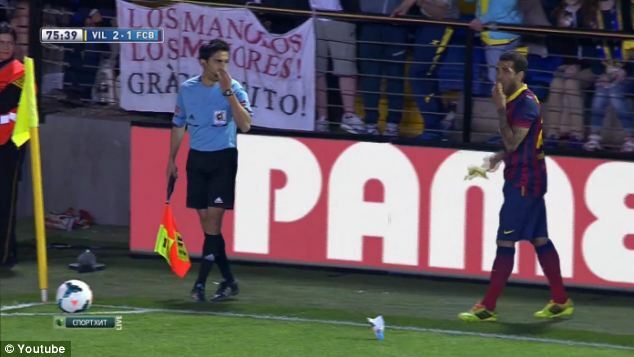 During soccer match in Villareal stadium, Dani Alves had a banana thrown at him as he approached to take a corner kick. Racism is still a problem in soccer and is mainly displayed by fans. Dani Alves and his team, who were very much aware of the possibilities of racist acts being displayed during the game, told each other if someone were to throw a banana at they were to eat it in mockery of the racist gesture. The eating of the bananas was commonly done because this is not the first instance of a fan throwing a banana at a player. Throwing bananas is one of the most displayed forms of racism in soccer. The home team was fined $17,000 for the incident and the fan was banned for life from all Spanish games. The surprising thing about the fan was that was a youth soccer coach. A youth soccer coach must encounter many people of different races and for him to act in such a way is disturbing. The one question that arises is it that he is an awful human being or was he an example of how the war-like stadium, which causes riots, fights and verbal disputes be a major cause of why he did what he did. A question widely discussed is whether the soccer stadium causes people to have a loss in morals. Situational ethics is a commonly coined term for this, which strongly applies to fans and players. Situational ethics is when people choose when to use ethical reasoning and when its acceptable to put them aside. Situational ethics may be the cause for the youth soccer coach and other people that you may never think would do horrible things to do them solely because they are pumped up in a soccer stadium. The picture above is from a woman’s soccer match. 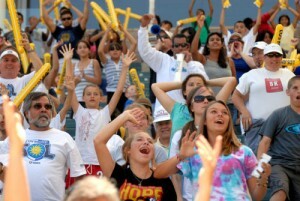 Looking at the fan base, it appears to be mostly young girls. The atmosphere from the photo seems to be very much a safe family environment. As you can see, the young girls are rooting for their teams with lots of energy and there does not seem to be any room for violence or any aggressive behavior by the fans. Like described in the section, the purpose for attending women’s games is for youth to look at role models and also for support of the players. The picture is a prime example of the clean, friendly environment, which is created due to the purpose of the fans attending the game. In this picture, you can very much see the aggressive pumped-up behavior that is expected at a typical men’s game. In the front row you can see the men yelling with their shirts of holding the flag in a battle-like manner. In an environment like this you could definitely expect a fight or a violent act to break out and there be little to no surprise of it occurring. The picture is an example of how fans get completely invested in their team and are clearly all for the team during the game. Recently returned from Vancouver after watching Canada v Switzerland and Japan v Nederland. To say that women’s soccer fans are subdued is something of an understatement. Lots of painted faces, flags, jerseys, and emotion. JOHANNESBURG, Nov 25 (Reuters) – The African women championship final between hosts South Africa and Nigeria had to be abandoned in the second half after a riot broke out at the Vosloorus Stadium near Johannesburg on Saturday. Riot police, who arrived 40 minutes after the trouble started, fired tear gas at the crowds and fought running battles with youths who were throwing bottles at them. Before that spectators threw bottles and other objects at match officials and at the Nigerian players after Nigeria had taken a 2-0 lead midway through the second half. Police said at least five people were injured as South African fans fought with Nigerian supporters in the crowd. Police had to carry several children, who were caught up in the fighting, to safety. Fans continued to throw objects on to the pitch for at least 30 minutes after the game was stopped, despite appeals for calm from Gauteng premier Mbazima Shilowa. The match was eventually called off and the trophy awarded to Nigeria. The 35,000-capacity stadium was overflowing for the match between the two African superpowers. Officials attempted to close the gates three hours before the kickoff to limit the number of spectators. ‘This is a very sad day for football in both Africa and South Africa,’ said Molefi Oliphant, president of the South African Football Association. He also criticised police for lack of control. Additionally, as we discussed in class, be careful not to generalize too quickly from anecdotal evidence about differences: be specific in terms of what kinds of differences you can actually identify between fans in different situations, and be clear about what you are comparing (i.e. professional vs. international games often have different types of behaviors). The information on here looks good, but you need to make sure to structure the pages correctly by making the “World Cup 2015” guide the parent page, and then making this intro page the parent page for the sub-pages. Since this will change the url, you’ll have to re-do the links on the pages as well.